A snowy street in Tianjin. December, 1994. As most of you know, Betsy loves snow and has been bitterly disappointed that we haven’t had any so far this winter. We had a problem with black ice Saturday night/Sunday morning here on Plateau, but that’s not the same thing. So, being the nice husband that I am, I tried to find a picture with snow that Betsy hadn’t seen. In the process I reminded myself of what it means to feel cold. 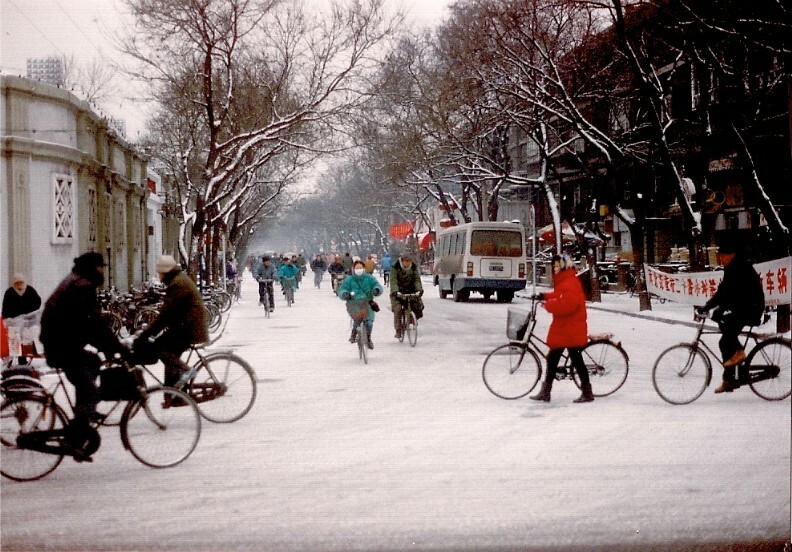 The picture above was taken outside the main gate to Tianjin Foreign Language University, Tianjin, People’s Republic of China, in December, 1994. I was teaching English at the university that year. The street scene is very typical of Tianjin at that time — a few motorized vehicles, but lots of bicycles. We didn’t have a great deal of snow in Tianjin that year, but it sure was cold. Like everyone else, I rode a bicycle when I had to go somewhere beyond walking distance. My apartment had heat, but the classrooms were unheated. I’ll have to admit that I never quite got used to teaching with my winter coat and gloves on! Fortunately spring did come to Tianjin and we all thawed out. But I do have many happy memories of my year in Tianjin and I hope Betsy appreciates the opportunity to see some snow! This entry was posted on January 19, 2009 at 3:30 am and is filed under China. You can follow any responses to this entry through the RSS 2.0 feed. You can leave a response, or trackback from your own site. Those bikers made this shot truly nice! have a great week ahead, if you find the time, my entries: here and here. A very pretty snow scene to share with all of us. Thank you and I hope you two have a wonderful week. I don’t *love* snow, but it was nice to see the beautiful white blanket on the ground a week ago. Wow! That sounds like quite an experience … teaching in China. Up north some Marylanders I know expressed the same sentiment about the lack of snow. What a great experience and that photo is beautiful. I can’t imagine not being able to jump in my heated vehicle when needing to go somewhere when it’s that cold out! It was snowing here an hour ago! It’s sunny now and almost completely melted! Hope Betsey enjoys the snow you’re getting right now! That’s a great photo! Don’t know why, but I just never imagined China would have much snow. Apologies to Betsy, but I’ve never been able to appreciate snow – I like to look at it on Christmas cards, but that’s about as close as I want to get! Interesting to hear about your time there – those unheated classrooms must’ve presented quite the challenge! I would have brought a portable heater! Loved the photo too! You and Betsy are welcome to visit Northern Michigan anytime!!! First of all it sounds like you have had a very interesting life George. That is a pretty snow picture but it looks so cold and after reading about teaching in a room without heat, oooh that just makes me cold. You’ve had a very interesting life! Well, I’m sure it continues to be interesting. I also have never thought of China as a place that gets much snow. I like the photo. It is snowing here today. Did those bikes have snow tires. Ha! What great memories for you. I love this picture. A great shot with some culture thrown in. I like your photo and the story! We have snow here also! Right now we have about 6″ on the ground, you could have some if you can figure out how to get to your place! LOL Thanks for stopping by my place. Have a great day!! What an interesting photo … hard to imagine folks riding bicycles in the snow. Hopefully Betsy enjoyed your thoughtfulness. Oh, George, right now it’s hard for me to imagine anyone wants snow! But I love the picture of China – for some reason, I don’t think of snow in China, but of course there is. What an interesting post, I did not realize you were a professor and in China, What a great experience and adventure you have had. I have only been to Canada. Would love to travel especially to Portugal and France. Tell Betsy we have lot of snow, over a total of 20 some inches already Yesterday was our 3rd storm in 2 weeks. It is not melting because our temps have been in the single digits. First time today it went to 34. We experienced the indoor temp dropping to 58degrees, our furnace ignition would not ignite. We lost our heat abour 1am this morning until the heating contractor arrived at 9:15 and fixed the problem. We were lucky to find that the problem was ice on the outside vent which was blocked by ice. Once it was removed we had our heat back. A very interesting post…and the picture would make a nice postcard. There is something about it that I love. Wow..what an experience to be in China..snow or not..